It’s been a long week since we last chatted and I miss you. Almost as much as I have missed bagel bites. And this is meant to be a compliment. You know, bagel bites. Those small nuggets of processed dough and cheese, topped with hard chunks of sausage-ness. 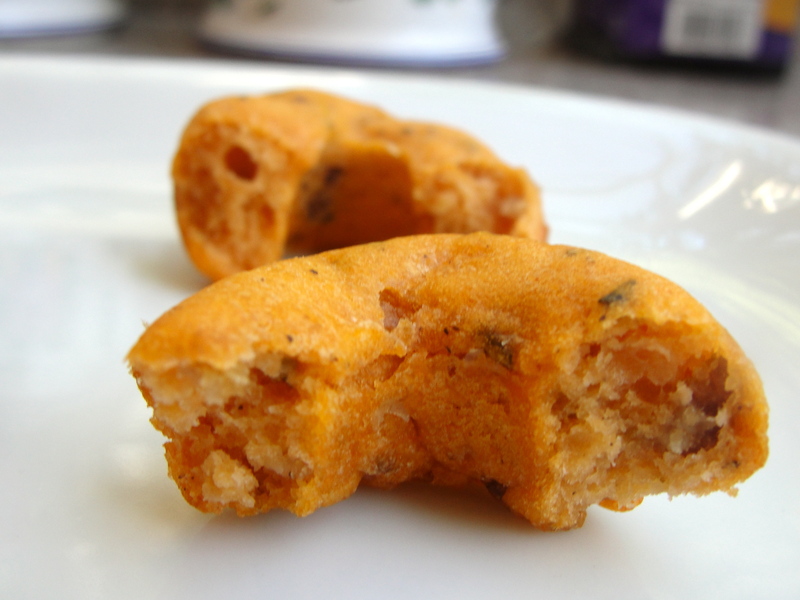 I loved bagel bites. And in my childhood, they were a symbol of one thing: studying for final exams. My mother tried to keep a somewhat healthy household. But dear old dad would always sneak in KFC on a Sunday or take-out any other day. And I quickly learned that if you could find a good reason for it, then wonderfully tasty, super processed food would find its way to the table. Clearly, the high-stress environment of cramming AP US history into one’s adolescent brain demanded the presence of such goodies. And thus, my love affair with the bagel bite began. But once sodium-heavy foods and almost all packaged goods were cut from my salt-free, safe list, so were those dear junk food treats. And because they are so salty and processed, I never even considered trying to recreate them for my new low-sodium diet. How could I? What a silly idea. That is, until I was gifted a mini-doughnut pan. Now most people would use a mini-doughnut pan to make doughnuts. Sweet doughnuts. Small ones. 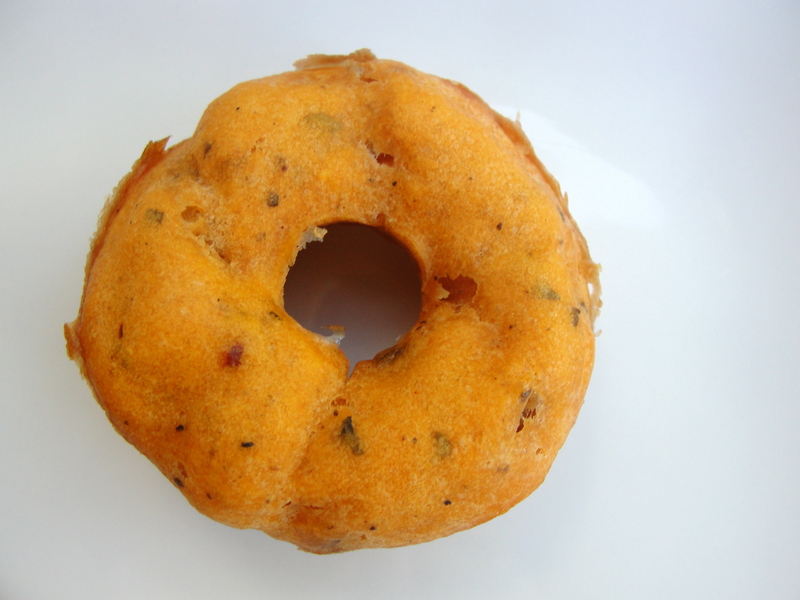 Which I did–so stay tuned next week for a salt-free carrot coconut cake doughnut recipe. 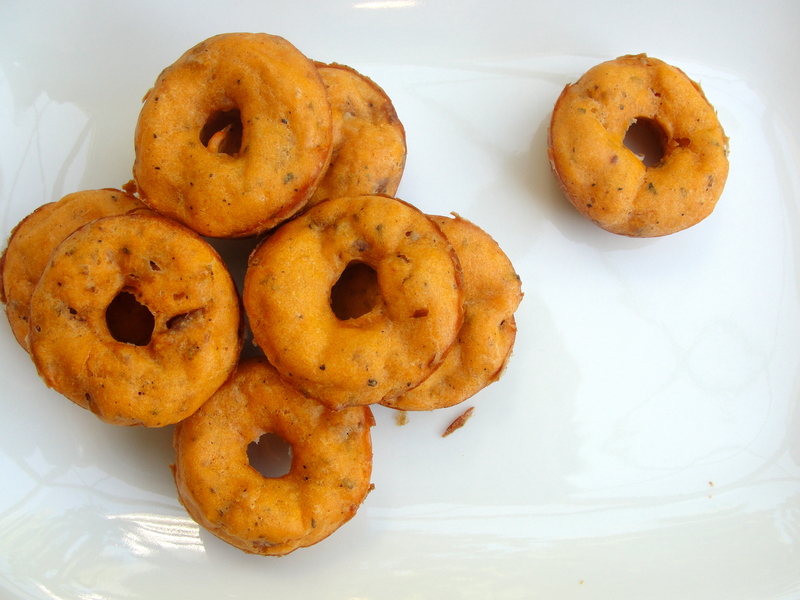 But I also used it to make savory doughnuts. And of course, the no-longer-silly, salt-free bagel bites. Ground pork. Tomato paste. Dried basil and oregano. Salt-free garlic and chili powder. Salt-free dreams turned into a doughy (and addictive) reality. They were tasty. Like pizza, but smaller. And while I’m still tinkering with the recipe, as I’m not yet satisfied with the texture (it’s a bit too dense for my junk food palate), I am completely excited about pushing another low-sodium boundaries. What once seemed impossible is now not far from my low-sodium reaches. And that makes me happy. And full. So while you wait for my kitchen notes to be perfected, I want to direct you to another site for good information, good recipes, and good low-sodium outlooks. She’s a fellow salt-free super hero who is tackling her own low-sodium diet as a result of Meniere’s Disease. Not only does Dishy come up with stellar low-sodium dishes, she’s actually started writing awesome profiles of fellow low-sodium eaters. And I’m honored to have been recently included. If you’ve ever thought you were alone in this low-sodium life, her interviews are a wonderful reminder that there are a lot of us out there. Ready to support each other. Guide each other. And make bagel bites to share with each other. So this weekend, here’s your homework: Head over to Dishy (here) and take a bite of her low-so good food as well as the amazing community she has gathered. And then, think of the bagel bite and do one thing to defy your low-sodium boundaries. Maybe that is exploring the wild aisles of the corner drug store until you find something safe and salt-free to snack on. Or maybe it is making a mini pizza. Whatever the adventure, you’ll be surprised at what you might discover. And how good this low-sodium life can be. We’re out here. We just need to consolidate our power base. (Sorry, I’m reading the Hunger Games trilogy and feeling very combative.) Bad experience last night at a favorite restaurant where everybody said, “Oh, yes. of course.” And delivered, “Well, not so much.” So excited about bagel bites. But I think they can be trained, ever so nicely, of course. So excited about the good tasting food I’ve put together for myself using the recipes and advice I’m finding here. Just all around very happy, thank you very much, Sodium Girl. And waiting for the donuts. Mmmm. I have an urgent issue I wanted your expert advice on. I just had a meeting with the dietician at the rehab center where my father is recovering after a serious heart attack. He is , of course, to be on a low-sodium diet from now on. When I asked the dietician how many mgs. of sodium were in my dad’s diet at the center, she said 2000-3000 mgs. a day. I said that that did not sound like low sodium to me. She then went on to say that a normal person with no kidney or heart problems can have 6-7000 mgs of sodium a day!! YIkes! I am dumb-founded and outraged. What do I say to the facility about this dietician who is so poorly informed about her specialty??! Here’s the truth: doctors, dietitians, fireman, even batman…they’re all human beings. Which means there is always room for error. Which means you have to be your best advocate. Chances are, even if you printed out the 2010 USDA regulations for the dietitian, she might not agree with you. So trust your instinct, seek secondary opinions if needed, and voice your concerns to superiors and your other doctors. It’s a lot of work but it’s all a part of taking health care into your own hands. Thanks for the shout-out, SG! And as for these bagel bites – YUM. Cannot wait for the carrot-coconut version. Or fall the fall, carrot-pumpkin? Sweet potato? some of each? Topped with powdered sugar and/or glaze? and jimmies? and maybe a little chocolate? A little overboard? I’ve just discovered you this moment and i am so excited! I was recently diagnosed with Menieres and am overcome with joy to find you, Thank you!! I just now this minute found you!!!! Please, whatever you do, do not stop blogging about low sodium ways!!!!!!! I can hardly wait to curl up with my laptop and your blog, and to go back and read the WHOLE thing, and write down recipes!!!!!!!! Thank you for sharing and blogging!!!! Especially about low sodium! I have recently discovered the “secret” of the cellular sodium-potassium pumps and how the correct potassium:sodium ratio in one’s eating plan can heal metabolic syndrome and a host of other maladies!! And now I’ve found your blog, and my world has expanded exponentially! Thanks so much!